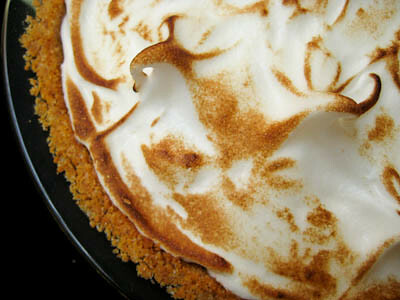 This week's Tuesdays with Dorie (TWD) recipe was chosen by Linda of Tender Crumb: Creamiest Lime Cream Meringue Pie. I'm not a big lemon meringue pie person, but I really liked Dorie's Florida Pie so I thought this recipe would also be worth a try. 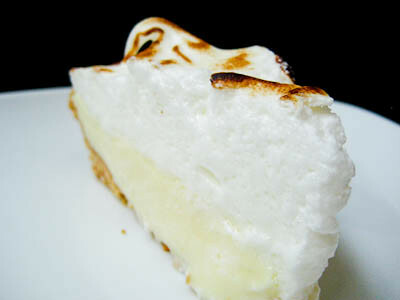 It's like your traditional lemon meringue pie, except with lime cream instead. But this isn't just any lime cream - it's a super tart, absolutely creamy, spiked with ginger - lime cream. I almost ate it all by the spoonful instead of putting it into my pie crust! It is definitely rich, but so good. I actually only added 2 sticks of butter (yes, 2 sticks!!!) into this cream instead of the 2 1/2 you are supposed to use. I know others omitted a whole stick and still ended up with great results. The only problem I had with this recipe was getting the cream up to 180F. This did not take 10 minutes, but rather 30-35 minutes. I had to increase the heat on the double boiler to bring the water to a boil instead of just a simmer, because it seemed that it would never reach 180F at just a simmer. Despite whisking constantly, I did end up with bits of scrambled egg in my cream. No worries, though, because though were removed when I passed the cream through the strainer to remove the lime zest. Otherwise, this recipe was really easy. It requires a lot of planning, as the cream requires 4 hours of refrigeration and the assembled pie needs to be refrigerated for at least 3 hours, but otherwise it doesn't take much time at all. 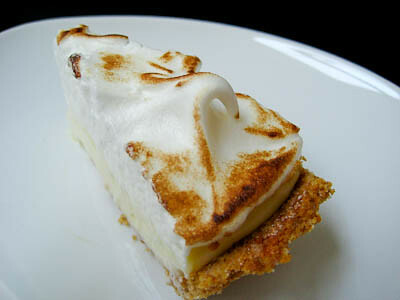 I used a graham cracker crust, so this really tasted like a key lime pie with a meringue top. I loved it! My husband and I actually ate half of it all by ourselves! Thanks Linda, for picking this recipe - I will definitely be making it again. If you would like the recipe, you can find it here. 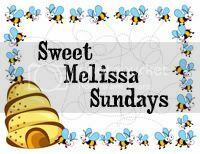 Make sure you check out the TWD Blogroll, to see how everyone else enjoyed this wonderful, tart treat. - Watch your pie very very carefully once you stick it under the broiler - it will go from beautifully browned to completely burnt in no time! Your pie looks great, Jamie! Weird how some had to whisk on the stove so long. Mine came to temp in about 9 minutes. I did have the water in the boiler at a good full simmer, almost boiling. I read that you can do that and have mroe water in the pan if you are willing to whisk hard and fast and do not stop. That's kind of what I did. Your pie is browned perfectly! I am so jealous - it is gorgeous! see, i'm not big on the lemon thing either, yet i LOVE lime. i applaud your decision to go with the green orbs, and you did a magnificent job! Davvero deliziosa questa torta, complimenti. Now that is gorgeous! 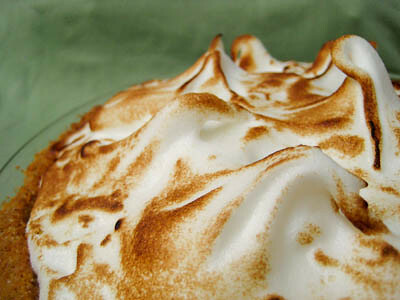 Your meringue is perfection!!! What a Lovely Lime Pie! Thanks so much for the tips. It will be a while before I attempt this pie, but I really want to after seeing beauties like yours. 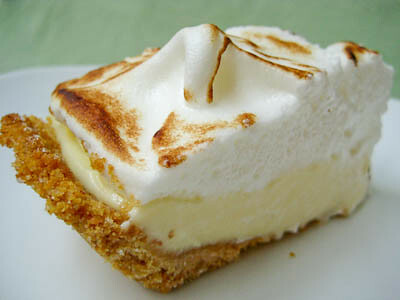 Your pie and meringue look wonderful. I gave up on the temperature thing. Lime cream sounds SO good! 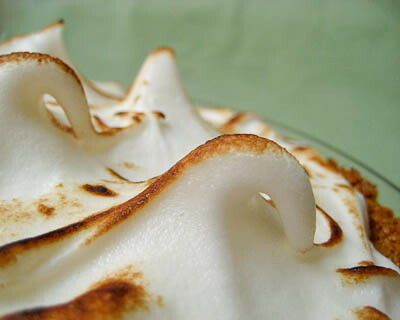 I love the shot of the meringue peaks--look almost like waves! I agree about the temperature issue--mine never came to 180 at all. Oh well! Glad you guys loved it. I ate my cream by the spoonful too! What a beautiful pie! Dang, it sounds like a lot of people had challenges in getting the cream to temperature. By the looks of your pie, your hard work paid off! Thanks for baking along with me this week Jaime! jamie, your pie is beautiful. Great job on the meringue. Wow jaime, that meringue top is so beautiful, and look delcious too. Jaime! that pic! OMG, I love lemon desserts. I have my doubts about meringue though. But I trust you. Doing this soon. Sigh. These photos are gorgeous and making me really really really crave this pie! It looks amazing! Can't wait to try it! Your pie is gorgeous, Jaime! That pie looks so good! Those pics seriously have me drooling! Gorgeous photos Jaime! I'm going to make this for one of the Twins' teachers. She loved key lime pie. Your meringue is perfectly browned. It almost looks too good to eat.